The Society has asked us to alert our members and other readers that the Spring Heritage Tour scheduled for May 11, 2018 that will feature a luncheon presentation by Dr. Bill Kelso and a walking tour of the Burwell and Pettus house sites has been fully subscribed at March 10 and no further reservations will be accepted. Our 2018 Winter meeting was held on Saturday, February 24 at the Salt Creek Grille in Dana Point, with 38 members and guests in attendance. Governor Scarlett Gathings Shepherd presided. We were pleased that First Arizona Company Governor Richard Burke could join us. Y-DNA: A male carrying the surname that you wish trace will be taking this type of DNA test. Traces the testee’s father’s line or the top of his pedigree chart; the testee’s strict paternal line. mtDNA: Either a male or female can take this type of DNA test. Traces the testee’s mother’s line or the bottom of the pedigree chart. The testee’s strict maternal line; all females, all the way. Autosomal DNA (Family Finder): Either a male or female can take this type of DNA test. Traces ALL lines of the testee back approximately 200 years. How much DNA do you have from your ancestors? Chaplain Sandra Orozco offered a memorial to deceased member Scott Krutilek. He was a valuable member, a fine gentleman and a friend to the Society. Several members shared their memories of Scott. His wife, Sandy and their granddaughter, Kathleen Flaherty, were present and joined in the memorial. Membership Chair Marty Sommercamp introduced seven prospective members who were among the guests. 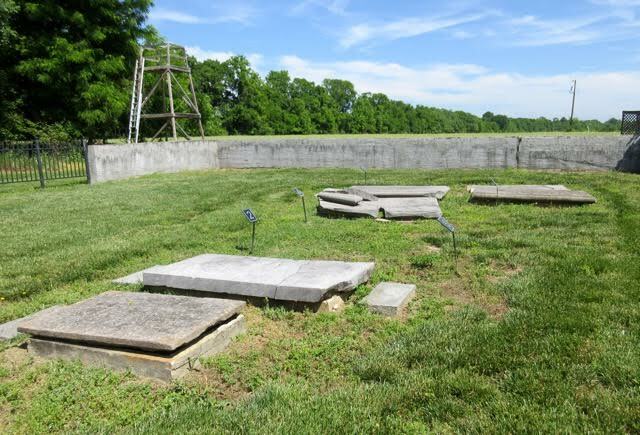 We were reminded that next year the Society will have a major ceremony to commemorate the 400th Anniversary of the first General Assembly in Jamestown. 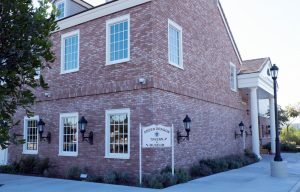 Its membership meeting will be held in Williamsburg on July 30, 2019, rather than on the customary May dates. 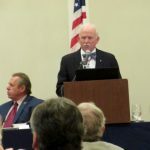 Jim McCall’s reports were distributed, including a summary of the Society’s 2019 commemorations, status of the continuing effort to Save the James, and of a new website feature with his request of members to submit two or three paragraphs telling what they know about any of their Qualified Ancestors, especially beyond what might be found in Adventures of Purse and Person and similar sources. Governor Shepherd spoke about the Veterans Pins and the one that was given to John Cahoon at our Annual Meeting on last June 24. 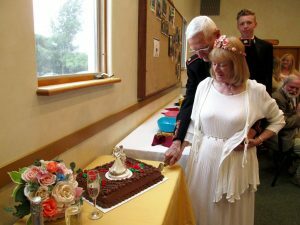 He passed away July 31, and was buried with his pin from the Society attached to his Navy cap. Lt. Governor Julie Plemmons reported that the Company’s Annual Meeting will be held on June 23, 2018, at the San Diego Yacht Club. Treasurer Suzy Leif reported on the sound financial status of the Company. 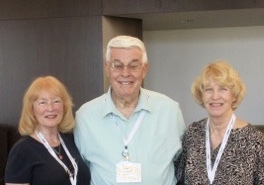 We will again have a table at the Southern California Genealogy Society’s Jamboree on June 1. There will be two other genealogical societies alongside our table, which should help attract more visitors. The Governor, Jim Shepherd and Sandy Krutilek will represent our company. NOTE: We are planning to revise our website and will want suggestions, comments and ideas from our members. We will be conducting an online survey in mid-to-late April seeking their help. Therefore, we urge them to visit and scroll through its pages and information to be prepared to respond to the survey. Our First California Company’s 2018 Winter Meeting will be held Saturday, February 24, 2018 at 11:30 AM at the Salt Creek Grille. 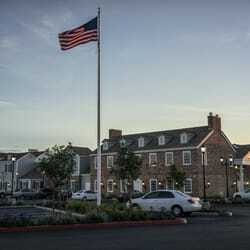 32802 Pacific Coast Highway, Dana Point, CA 92629 (location and directions below). The general membership meeting will be followed by luncheon (selections below) and the program on how to decode the confusing terms of DNA. We will welcome Cheri Mello, Family Tree DNA Administrator, who will discuss Deciphering the DNA Soup. You have had your DNA tested, now, how do you use that tool to connect to your ancestors? Cheri will unlock the answers you have always wondered about and provide case studies that have used DNA to overcome brick walls that stood since the 1950s. You won’t want to miss this program! 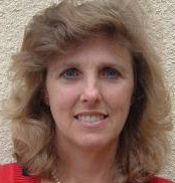 Cheri Mello began dabbling in genealogy as a 5th grader with the U.S. History assignment. She began her active adult research over 25 years ago, after the death of her remaining grandparents. Her expertise ranges from various areas of America, to Portugal, as well as DNA, genealogy software, Find A Grave, and more! The total cost is $40 per person. Please make your reservation to be received by Saturday, February 10, and mail your check to: Treasurer Suzy Leif 3345 Hopi Place, San Diego, CA 92117-3516. Please include the total dollar amount of your reservation(s), the names of all in your party, plus each e-mail address and phone number. Also, please advise whether they are FCC or Jamestown Society members, Friends or guests. 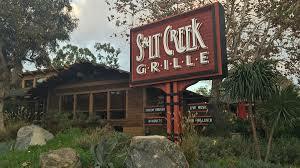 The Salt Creek Grille is at the southeast corner of Crown Valley Parkway (southbound exit from I-5) and Pacific Coast Highway (northbound exit from I-5.) Its phone number is (949) 661-7799. First California Company has cancelled its Fall 2017 General Membership Meeting and Luncheon for 11:30 AM on Sunday, November 19. Our next meeting will be Saturday, February 24, 2018; details will follow closer to the date. I admit that, despite many clues, until recently I never thought much about what role Europeans played in New England before the Pilgrims arrived on the Mayflower in 1620. All I knew was that their native friend, Squanto, greeted them in English, having been kidnapped and carried off to Europe years earlier. Tragically, when he returned, everyone in his village had died of a European disease. Where his village once stood was now the site of the colony of Plymouth Plantation. We also know that our ancestors agreed to the Mayflower Compact, signed in 1620 off Cape Cod, because they somehow missed arriving in “Northern Virginia,” which was the area of their land patent. So, when did Europeans first reach New England? 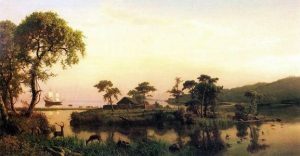 Where did the name “New England” come from? How about “Cape Cod?” How about “Plymouth?” And was there competition? The answers to these questions actually lie in Jamestown, the first English language colony to survive, founded in 1607. The key founder of Jamestown was an Englishman called Captain Bartholomew Gosnold, born in 1571. He pursued a seafaring life. Before Jamestown, in 1602 he explored colonialization in “northern Virginia” in what is now New England. In doing so, he named the peninsula he reached, Cape Cod because … well, there was a lot of cod. He named an island there for his dead daughter, Martha’s Vineyard. On another island off the cape, now called Cuttyhunk Island, he and his people built a fort, but after a month they abandoned it. The English by this point were quite keen to colonize in North America and as a result two rival joint stock companies were chartered, the Virginia Company of London, based on where its organizers lived, which had jurisdiction in what is now the American South, and the Plymouth Company, based on where its organizers lived, which had jurisdiction in what is essentially now New England. In Dec 1606, Gosnold managed to pull together enough backing via the London Company, which he helped found, for another try and this time set out for what would become the Jamestown Colony. He died there in August 1607. 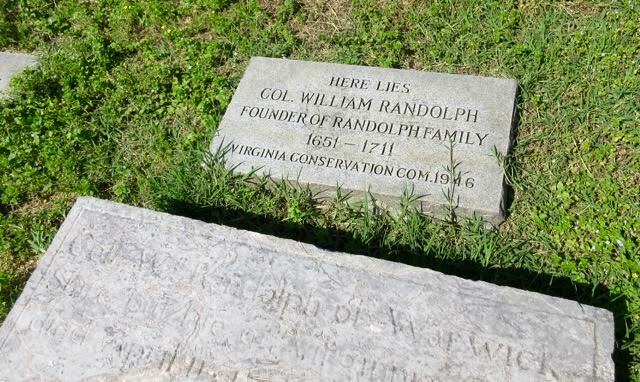 In 2003, what is probably his long-forgotten grave in Jamestown was discovered by archeologists. There was another try at establishing a colony in Maine, the “Popham colony” in 1607, at the same time as Jamestown. This effort was sponsored by the rival Plymouth Company, organized by John Popham and Ferdinando Gorges, and led by John’s nephew, George Popham. Both John and George Popham died the first winter and the colony was abandoned within the year. In 1609, Captain John Smith, who had been the president of Jamestown’s governing council, left for England after injuries and in disgrace. 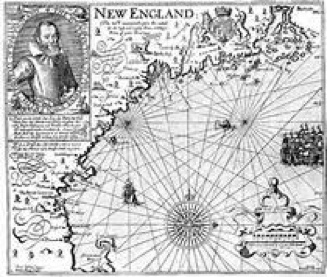 But, in 1614 he again set sail for the New World, with two ships, this time to explore Maine and Massachusetts. In 1616 in England, Smith published a book called A Description of New England. It is believed that this was the first time the name of New England was used for the area. Smith created the map shown here and gave place names to various locations along the coast of Massachusetts including New Plimouth near Cape Cod. It is unclear where the diseases that decimated the native people came from, but we know that in the years after Smith’s visit and before the Pilgrims arrived, a number of fishermen, French as well as English, frequented New England’s waters. Cod was a very valuable commodity. The religious separatists in Leiden, the Netherlands, who became known as the Pilgrims, must have poured over that book. It was they who chartered two ships, including the Mayflower, for their voyage to the New World. In 1619 in London, the Leiden separatists entered into a deal for a land patent with the London Company in the jurisdiction of the London Company, i.e., no further north than New York, as well as ships with the same company. When the Pilgrims started negotiations, they were soundly cheated by their original investors. 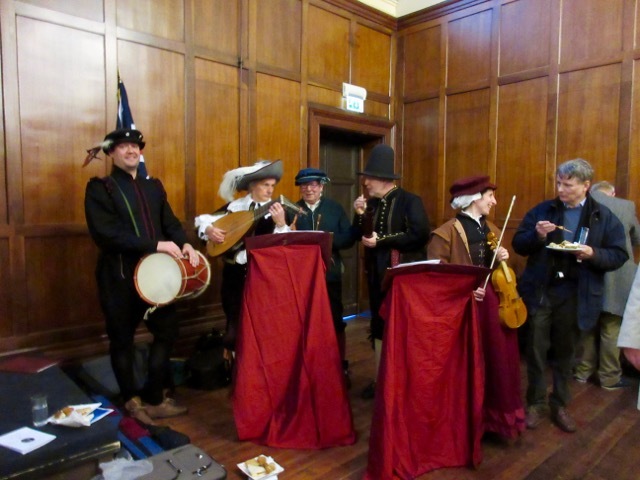 To satisfy new backers, a consortium of London financiers known as the Merchant Adventurers, they had to include “Strangers” among the passengers. Many of the passengers on the Mayflower were not separatists but instead Strangers. By accident or design, the Mayflower’s arrival on Cape Cod was considerably outside the jurisdiction of the London Company. The following year in 1621 the Pilgrims obtained a new patent from the newly reorganized Plymouth Council for New England. One of the Strangers was Stephen Hopkins, who came on the Mayflower with his second wife, some of his children, and two servants. Stephen was unique in that he was the only passenger who had ever been to the New World before. In 1609 he had come on the “third supply”, then spent 9 months on Bermuda after a shipwreck, before the castaways built two smaller ships to get to Jamestown. He then spent several years in Jamestown. A letter regarding “Eliezer Hopkins” arrived in Jamestown in 1614, probably bringing the news his first wife had died, and so he returned to England, Thus, he is a qualifying ancestor for both the Jamestowne Society and the Mayflower Society. And not to forget the Canadian connection: The English were not the only Europeans interested in the area. The French made several attempts to colonize in New England, mostly minor settlements for fishing and hunting as well. Their first real North American colony was established in 1604 at St. Croix, an island at the extreme northern edge of what is now Maine. St. Croix failed due to disease and in 1605 the founders moved what remained of it to what became Port Royal Habitation in modern Nova Scotia. A second French attempt in New England was a Jesuit mission called Saint Sauveur founded in 1613, also in northern Maine. Two months later forces launched out of Jamestown wiped out both Saint Sauveur and Port Royal in 1613. Thus, Jamestown made New England safe for English Protestants. And so, in 1620 English Protestants, i.e., the Pilgrims, started the successful colonization of New England. Erica Hahn is a member of the California Mayflower Society and the Jamestowne Society. Natalie Zacek, “Bartholomew Gosnold (1571-1607,” Encyclopedia Virginia, Virginia Foundation for the Humanities, https://www.encyclopediavirginia.org. James Truslow Adams, The Founding of New England. Boston, the Atlantic Monthly Press, 1921. Brenda Dunn, A History of Port-Royal/Annapolis Royal 1605-1800. Halifax: Nimbus, 2004. Each year, the Council encourages the Governor to participate in the Society’s spring Governors’ Forum and other meetings held annually in Williamsburg. Following is my report on my participation May 18-20, 2017. On May 18, the Society leadership hosted a reception for company governors and their guests. We travelled by motor coach from the Williamsburg Lodge, where the main events were held, to Jamestowne Island. 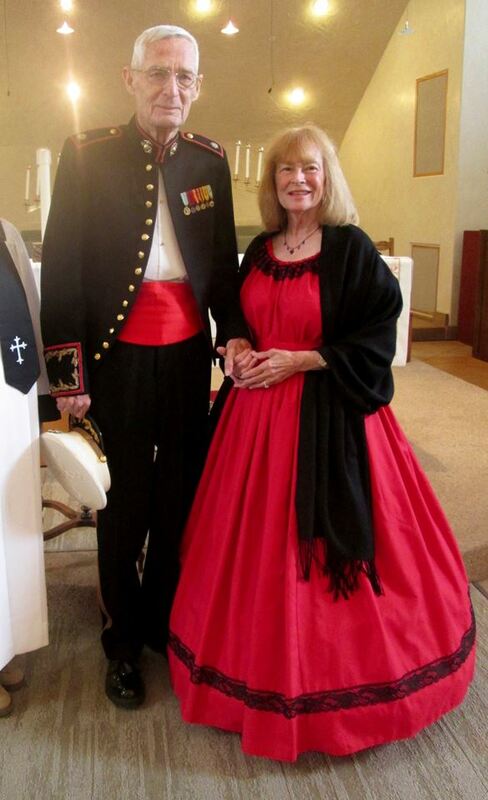 We were met there by a reenactor portraying Governor Yeardley, who led the group to the Dale House Cafe. 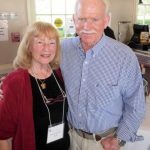 We gathered for wine and cheese and met Dr. Bill Kelso, Jamestown Rediscovery’s Head Archaeologist, where I purchased an autographed copy of his most recent book, Jamestown The Truth Revealed. We also met Dr. James Horn, President of the Jamestowne Rediscovery Foundation and David Givens, our 2014 Alice Massey Nesbitt Fellowship winner and Senior Archaeologist at Jamestown Rediscovery. 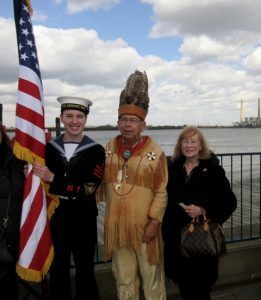 I had previously met Mr. Givens in March at St. George’s Church in Gravesend, England for the Pocahontas Life and Death 400th Anniversary Celebration, where he spoke about Pocahontas and the archeological work at Jamestown. We received an informative update on the dig progress before we returned to the Lodge. The Governor’s Forum was held the following day. The Society’s Lt. Governor Roy Martin, Jr., discussed annual giving, followed by fund recipient reviews. We also discussed fellowships, and the Elizabeth B. Wingo, Jamestowne Island, Building & Grounds, endowment and unrestricted funds. Jamestowne Society Magazine Editor Susan McCrobie reviewed the requirements for submissions. Governor Zillion discussed the new Veterans Recognition program. Jane Alexander also talked about how we are linking Revolutionary War era ancestors with our Qualifying Ancestors. 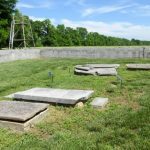 We then boarded buses to Jamestowne Island for a tour of the dig site, Archaearium and private vault. I especially enjoyed the vault as I had never been there before. Over two million artifacts – lost, broken, or discarded by the early colonists – are housed in its state-of-the-art collection room. 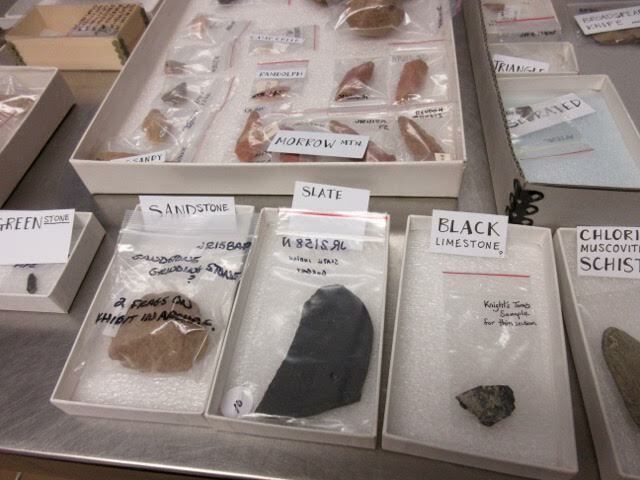 They are cataloged and analyzed with representative objects on display that show interactions with the Virginia Indians. reenactor from the night before and who now portrayed Capt. Edward Brewster. The very knowledgeable Jamestown Rediscovery staff also served as tour guides. We had box lunches at the Dale House Cafe. It was a long but interesting day but unfortunately it was unseasonably warm for Virginia in May. Many of the others met for the Governors’ Dinner at Christiana Campbell’s Tavern, which is said to have been a favorite of George Washington’s. As I had the pleasure of dining there the year before, I chose instead to make it an early night in order to recover from the heat of the day. The Society Council’s most informative meeting was held the following day, May 20, in the Williamsburg Lodge. Among items discussed were new insignia items, such as a new duffel bag and new style signet rings. The Council also conferred an Honorary Society membership on Dr. Bill Kelso. Governor Zillion also mentioned and reiterated the Society’s opposition to Dominion Energy’s proposal to build transmission towers across the James river. The Council also approved a sash for former Governors. The Membership Luncheon followed and was preceded by a bagpiper in Scottish regalia. Governor Jerry Zillion recognized the veterans who were in attendance and presented a new company charter to the Bay of Naples (Florida) Company. He then surprised Dr. William Kelso with the announcement that he had been named an honorary member of the Society. 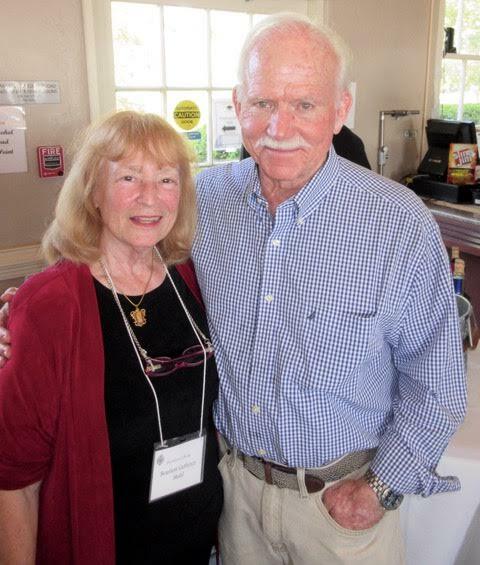 Dr. Kelso was accompanied by his wife and was the guest speaker. He reviewed the current explorations of the sites of early churches within the confines of the 1907 Memorial church. After the luncheon, he made himself available to sign his new book. It should be noted that in March I had invited Mr. Givens to speak at a First California Company event and stay at our San Diego home. I reminded him of my offer at the wine and cheese event and he indicated that he might be amenable. I also took the opportunity of inviting Dr. Kelso and his wife to stay with us and give a talk at our luncheon and sell his book. graves. 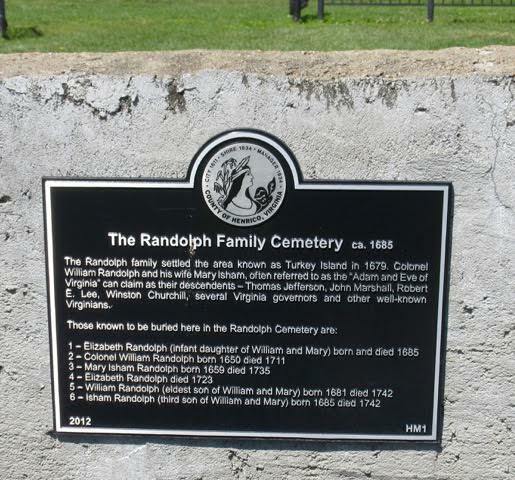 I have been told that it is the oldest family gravesite in the United States. 1619 site of the first Thanksgiving (not Plymouth.) There, I needed to pick up some things for our First California Company luncheon this coming November. My ancestor Theodorick Bland is buried next door at Westover, so I also stopped there to place flowers. Shirley Plantation is nearby, where Robert E. Lee’s mother grew up, as well as Sherwood Forrest, the home of President Tyler. So, I combined history remembrances with my conference. 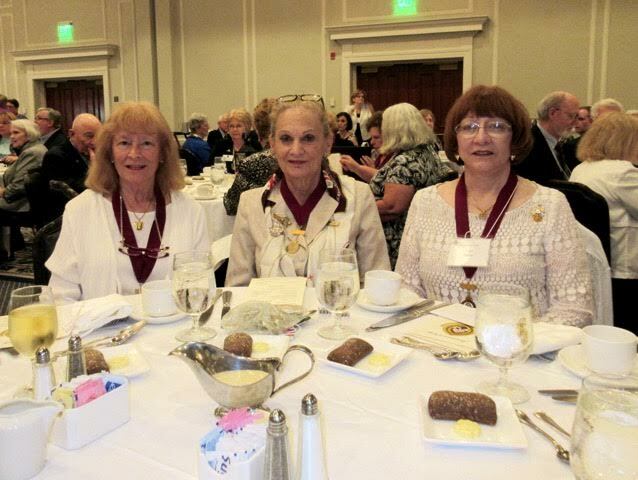 Last, but not least, was the opportunity to renew friendships at the conference, including Jane Cralle Congdon, the Society’s Regional Chairmen Coordinator; Jane (“Xan”) Alexander, the Society’s Webmaster and Western Regional Chairman; Fran Davis, former National President of NS Colonial Dames of the XVII Century; and, former Society Attorney General Susan Godman Rager. 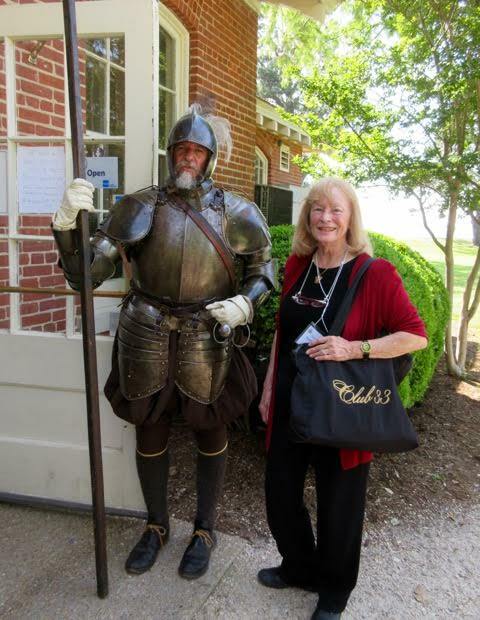 I encourage all members to attend our Jamestowne Society meetings and conferences. First California Company’s 2017 Annual Meeting and Luncheon will be held Saturday June 24, 2017 at 11:30 AM at the Green Dragon Tavern & Museum in Carlsbad (north San Diego County). 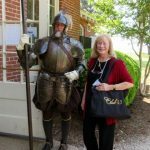 Our program will be Early Virginia Genealogy; Finding Deeper Roots; to be presented by KC Reid, MS, MLitt., of Deeper Roots Genealogy. 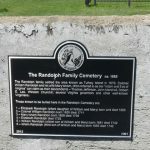 KC Reid is a Professional Genealogist with emphasis on colonial research, lineage societies, military records, copyright law, world and slavery history, courthouse records, deed, immigration and politics. 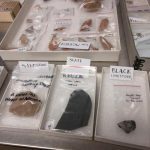 Of particular interest to our prospective applicants and members, KC will be sharing ways to find that elusive proof for your Jamestowne ancestor. 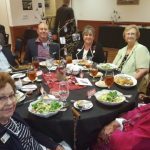 Our membership chairman and other members will be available to meet with prospective applicants and members after the luncheon either at the Green Dragon or at the nearby Cole Library to discuss their individual applications. 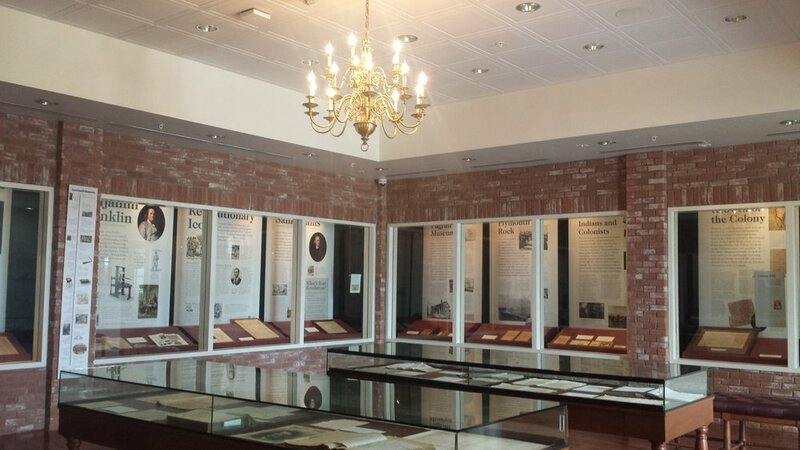 (NOTE: The Cole Library has an extensive genealogical section for research.) Please advise on your reservation if you would like discuss your application or contact Marty Sommercamp at sommercamp@roadrunner.com or phone: 858-481-8314. We will meet in The Green Dragon Tavern & Museum’s Presidents Room. 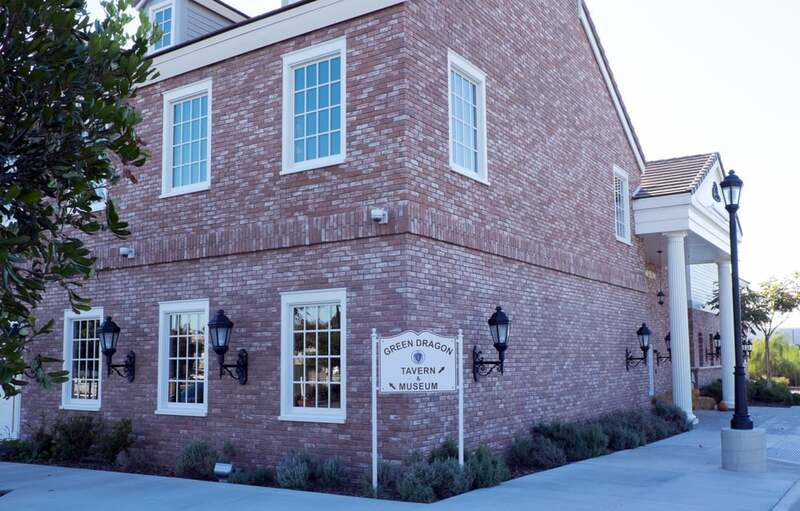 It is located at 6115 Paseo del Norte, Carlsbad, CA 92011 (see directions below); phone: 760-918-2421. 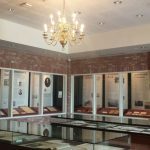 Please plan to allow some extra time to tour the restaurant’s unique museum, which displays numerous historical exhibits and artifacts from our nation’s Revolution. The cost of the luncheon and program is $40, and menu choices include Shepard’s Pie, Fish ‘N’ Fries, New England Grilled Chicken Salad and Vegetarian New England Hummus Salad. Yours reservation and check must be received by June 10, 2017. For more information or details, please contact Lieutenant Governor Julie Plemmons at jpnkids@yahoo.com or 619-207-7006. Directions: From I-5 north or south, exit at Palomar Airport Road and go east to the first traffic light (Paseo del Norte) and turn south for about one block. The Green Dragon is on the right. Look for a sign directing you to the Museum. Park in the south side of the parking lot and enter through the Museum Doors (differs from the main entrance.) Look for The Presidents’ Room. 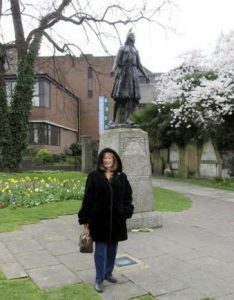 As Pocahontas was my tenth great grandmother, I was invited by Reverend Canon Chris Stone of St Georges Church in Gravesend, England to attend the March 21, 2017 commemoration of her death and interment in the church, 400 years from the date of her burial. 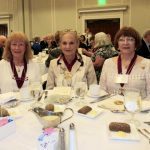 I also attended as Governor of First California Company of the Jamestowne Society, as well as on behalf of the National Society of Colonial Dames of the XVII Century, as its California State Chair of Pocahontas Gardens, Projects and Scholarships. I believe that I was only Pocahontas descendant in attendance. 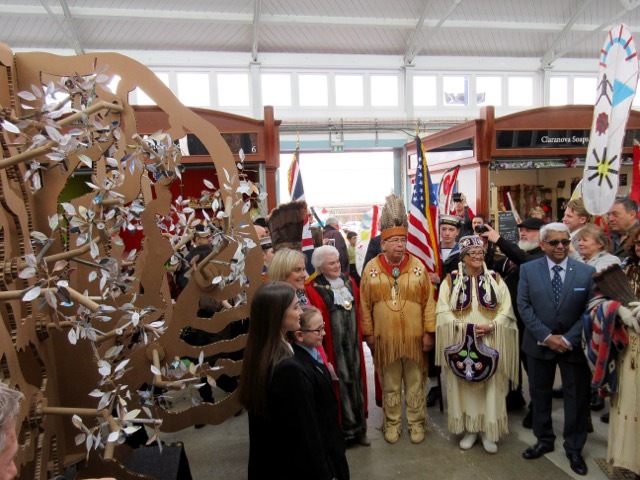 The commemoration was the highlight of the community’s two-year Pocahontas 400 Life Celebration. Gravesend is an ancient town on the Thames with over a thousand years of English history. It was the port of departure for ships sailing to the New World and where Pocahontas died and is buried. She was better known to her tribe as Matoaka, daughter of Powhatan. She was called by her Christian name Rebecca in England, where, in 1616, the Virginia Company sponsored her tour and appearances to help promote Jamestown and its nascent tobacco industry. 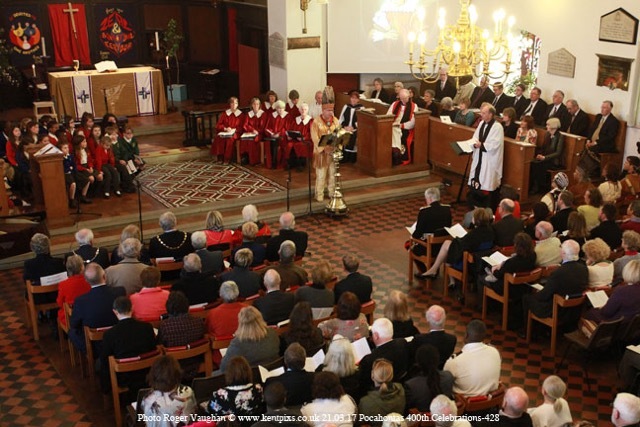 A view of the service at St. George’s; I am in the left fifth row, aisle. Chief Adams of the Mattaponi Tribe is at the lectern. 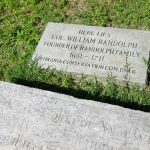 “…Pocahontas, in her 22nd year, was due to return to Virginia with her husband and son in March 1616 , sailing on the George, which was under the command of Captain Samuel Argall. Either ashore or onboard, Pocahontas succumbed to the illness she had endured and breathed her last. It’s said that her last words were, ‘all must die. ‘Tis enough that the child liveth’. 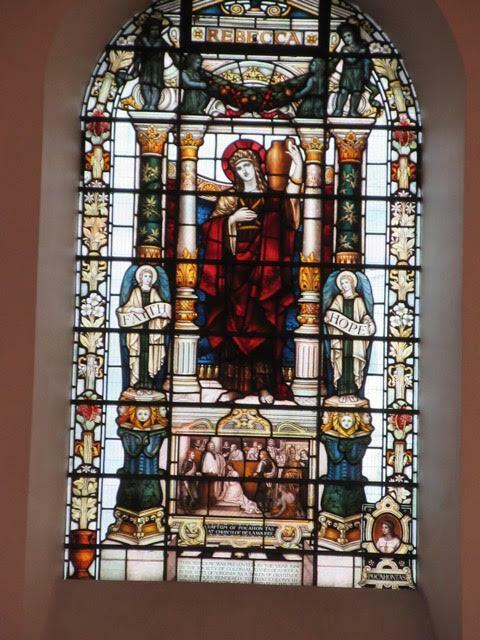 The Reverend Nicholas Frankwell MA [Cantab], then rector of Gravesend, may well have conducted the burial service, laying Pocahontas to rest. 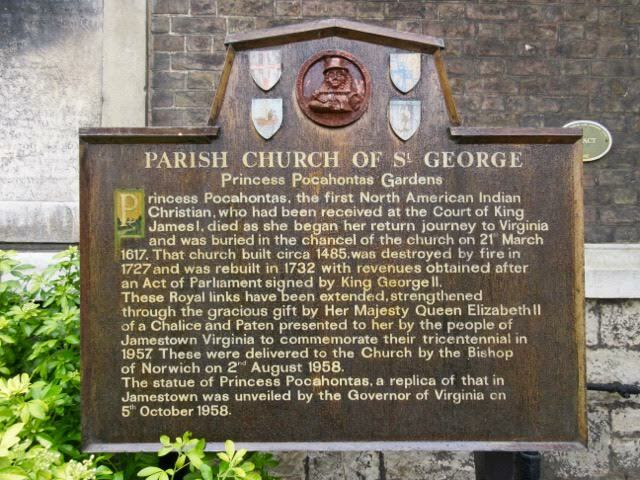 “The church building in which, most agree, Pocahontas was buried, burned down in 1727, along with much of Gravesend. In due course, thanks in part to monies granted by the Gravesend Churches Act 1730, a new church was built and opened in 1733. Ever since then, the whereabouts of Pocahontas’ remains have been a matter of conjecture. A statue in the gardens of the rebuilt church was erected in 1958 and is a copy of the one in Historic Jamestown. 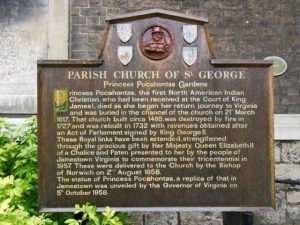 This memorial to Pocahontas, who lost her original name and religion, and in 1616  her life, has been relisted by Historic England to mark this 400th anniversary. The life-size bronze of Pocahontas has had its heritage list entry updated to include a full description of her life and role in English and American history. I saw school children placing flowers at the statue of Pocahontas the day before the service. Pocahontas 400 led up to the anniversary day of her burial. 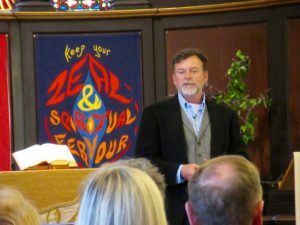 I arrived on Sunday, March 19, and, at the church crowded with guests, heard David Givens of Jamestowne Rediscovery give two interesting talks, a slide show on Pocahontas and the archeological excavations at Historic Jamestown, After David’s first talk, he gave Reverend Stone one of the books he had written. 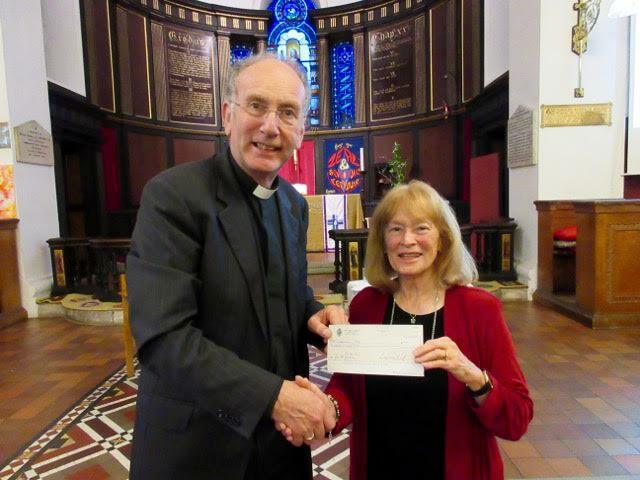 After his second talk, I gave Reverend Stone a $200 check from our First California Company and its members for the maintenance of the church’s Pocahontas Gardens. Hearing my own short speech, David Givens added that he was very grateful to the Jamestowne Society for giving him a grant for his Master’s Degree at the University of Leicester in England. 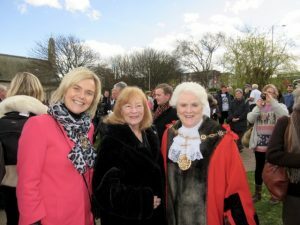 Tuesday, March 21 was an exceptionally sunny and beautiful day, where several hundred invited participants gathered for a parade in nearby St. Andrews Park, with costumed musicians playing for the crowd. As the crowd was gathering, there was a ceremony aboard a small red ship on the Thames where water from the James River was poured into the Thames to join the two rivers and two nations. Pictured before the statue are: Reverend Canon Chris Stone; the Mayor’s daughter, Victoria Bonce; the High Sheriff of Kent, Mrs. Kathrin Smallwood; Chief Emeritus Kenneth Adams, Upper Mattaponi Tribe; Mayor of Gravesham Greta Goatley; Lord Lieutenant of Kent, Viscount De L’Isle; me; The Right Reverend James Longstaff, Bishop of Rochester; Chief Anne Richardson, Rappahanock Tribe; Chief Stephen Adkins, Chickahominy Tribe. 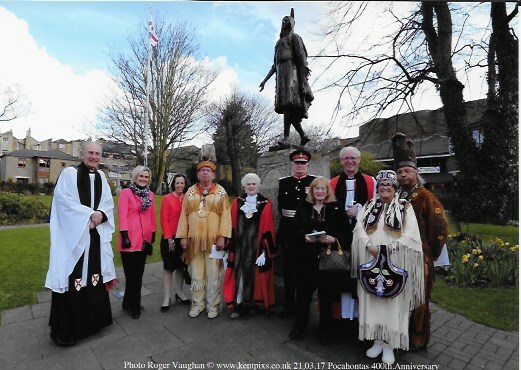 Among the dignitaries who attended the commemoration events and service were: Mayor Greta Goatley of Gravesham; her daughter Victoria Bonce; the High Sheriff of Kent, Mrs. Kathrin Smallwood; the Lord Lieutenant of Kent, Viscount De L’Isle; the Right Reverend James Longstaff, Bishop of Rochester; and, three Indian Chiefs from Virginia: Chief Emeritus Kenneth Adams, Upper Mattaponi Tribe; Chief Anne Richardson, Rappahannock Tribe; and, Chief Stephen Adkins, Chickahominy Tribe. 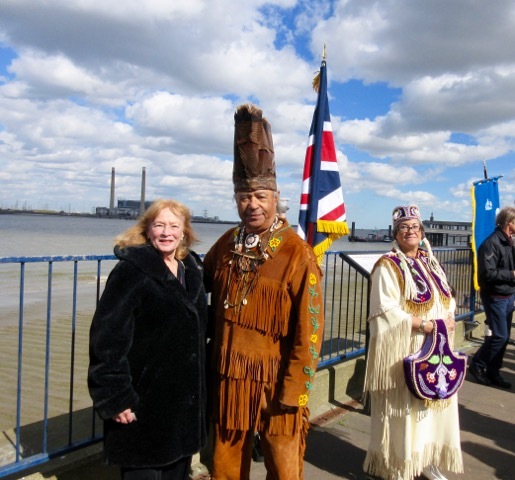 The US Ambassador to Great Britain had attended another commemoration event earlier this year. I then participated in the early afternoon parade through the village with a stop at The Market Place to see a sculptural Peace Tree and a display of colorful feathers by Kent-based Animate Arts, created to commemorate Pocahontas. Legend has it that Pocahontas planted a mulberry tree at a manor house in Heacham, Norfolk, where Rolfe was from. 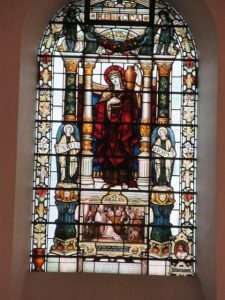 Upon arrival at St. George’s Church, Bishop Longstaff presided over a special service, during which Reverend Stone thanked the Jamestowne Society, Colonial Dames of the XVII Century and me for our support of his church. The Church was packed to capacity with invited guests, while an overflow crowd was able to view the services on television in another building. Afterwards, we went to the Old Town Hall for refreshments with the Mayor, which was accompanied by the costumed musicians. I am grateful to Reverend Stone for inviting me to attend as it was very moving. With permission, two photos were shown from Kentpix. We regret to report the passing of our valued and steadfast member, Scott Burgess Krutilek; April 24, 1938 ~ February 28, 2017. He was active in our company’s Council for many years, a friend to many and brought joy and a large measure of good will to our meetings. He is missed. Use the “Donate Now” button on the Society’s website, and designate it for the Wingo Fund and dedicate your donation to a Memorial for Scott Krutilek. You can mail a check payable to the Jamestowne Society with the memo Wingo Fund in memory of Scott Krutilek.